This simply creates 4 platforms, stops gravity from making them fall and gives them all the same initial horizontal velocity. When the player jumps on this type of platform we let Phaser handle the collision. Due to the way Arcade Physics works there is a special condition that means that the player will automatically “ride” with the platform. So as it moves horizontally the players x position is adjusted to match. You can see this by running Part 1 of the code and jumping on to a green platform. But what if we don’t want that to happen? What if we want our player to fall off the platform, and not ride it? Perhaps the platform is covered in ice? For that we’ll let the platform set its own friction. The conditional checks if the platform is an ice one, and if so adjusts the players body to compensate for the distance the platform has travelled. Obviously you don’t have to check the image key to do this – it would make more sense if you had a special custom Game Object that knew if it was slippery or not, but the end result is the same. You need to effectively undo the horizontal drag that was applied by Arcade Physics. If you run the code you’ll see that on the green platforms you can ride them, but on the snow covered ones you slip right off. Perfect. Now we’ve got two types of platform, let’s create a little game from them. In this game you will just have to try and jump to the top of the world. 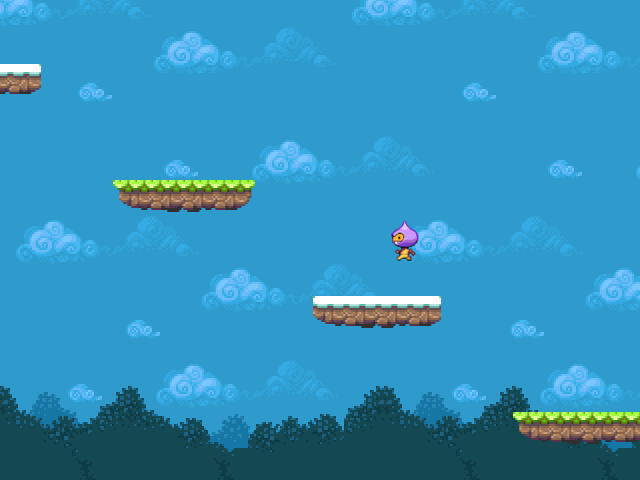 The game world is 2000 pixels tall and you start at the bottom, so you’ve a bunch of platforms to traverse. All of them are moving at varying speeds and they alternate between ‘slippery’ and not. Run the second piece of code to play this game. One thing platform games often do is give you a small window of opportunity to still jump, even when you’ve fallen off the side of a platform. This is implemented in the Jump Up game through the edgeTimer property. The edgeTimer value is checked against the clock – and if the player presses the jump button, and they do so within 250ms of falling, they will still be allowed to perform the jump. It’s up to you what values you set for this. 250ms may be too high, or too low, it’s very game specific. But it felt “right” for this particular game. Tweak it as you need. The minus sign is added because otherwise the background scrolls in the wrong direction to the world. Whatever you decide to do hopefully this has given you a taster. If you evolve this further I’d love to know! By changing the Body.friction property you can influence what happens if something lands on it. The default is x: 1, y: 0 – which means the player would ‘ride’ the platform. If you set x to zero, it will slip off. If you set x to 0.5 it will slip-off, but at half the rate of the platforms velocity (i.e. a slippery platform, but not quite!). You then don’t need to use a collision callback at all, Phaser will handle it for you. Until this feature lands in the master branch use the callback approach described in this issue. Entity Component System for Phaser – Part 2 The next part of the ECS adventure! Phaser 3 Development Log Thousands of tiny troops! Phaser and TypeScript Video A complete game in an hour. Posted on January 23rd 2015 at 10:59 am by Rich.